Antibacterial, balancing and relaxing. The ultimate in ylang oils, this premium quality organic Ylang Complete Essential Oil is exactly as described, and has not been fractionated into different grades and is therefore natural and ‘complete’. Many so-called ylang complete oils are really an undetermined mixture of grades ‘extra’, 1, 2 and 3. This is because there is little demand for a complete oil from the perfumery industry, who have historically dictated and dominated ylang oil production. Over recent years, demand has grown for an organic ylang oil that is distilled continuously in the traditional way, without interruption (fractionation) for separate grades of oil. Grown and distilled in Madagascar, our organic Ylang Complete Essential Oil has a fragrance that is warm, full and floral with a hint of spice, displaying a richness and depth not present in any other grades of ylang oil. 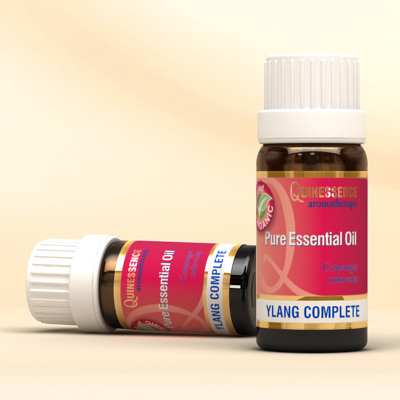 Organic Ylang Complete Essential Oil delivers both a euphoric and sedative effect on the nervous system, helping to combat stress, slow down a fast heart rate, and lower high blood pressure. It is recommended for both oily and dry skin types due to its balancing and soothing properties, and it can be used in hair care too since it acts as a tonic to the scalp, soothes itchy dandruff, and leaves hair soft and shiny. Germacrene D, b-Caryophyllene, Geranyl acetate, Bicyclogermacrene, trans,trans a-Farnesene, d-Cadinene, a-Humulene, p-Cresyl methyl ether.